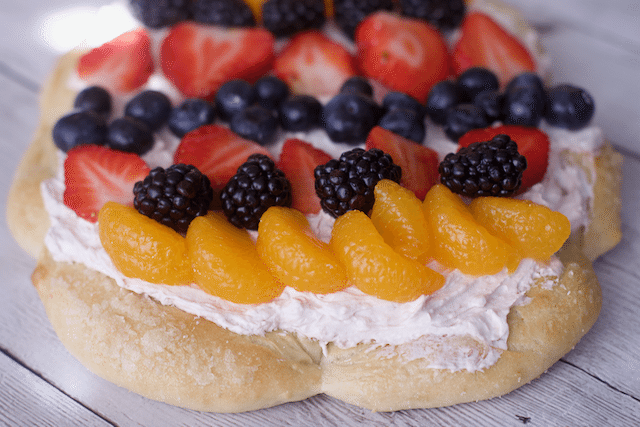 This post about a Deliciously Easy Easter Fruit Pizza Recipe is brought to you thanks to the free samples provided by Rhodes Breads. Rhodes frozen bread products are so versitale and is a great freezer item to have ready from sweet to savory dishes. 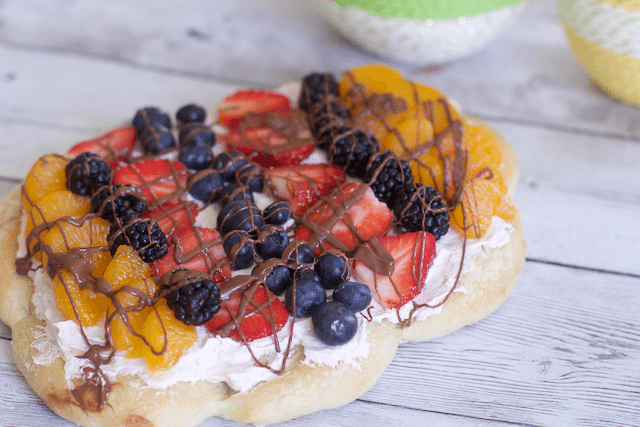 Have you ever had a dessert pizza before? 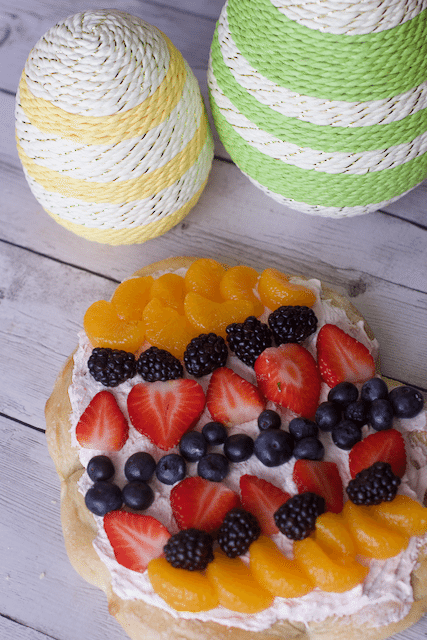 Today we are sharing a Deliciously Easy Easter Fruit Pizza Recipe that you can make year round but we decided to shape our dough into an egg shape and decorate it with the fruit to look like a decorated Easter Egg. Hope you and your family enjoy this recipe as much as we did. Be sure to check out our other Easter Treats too. 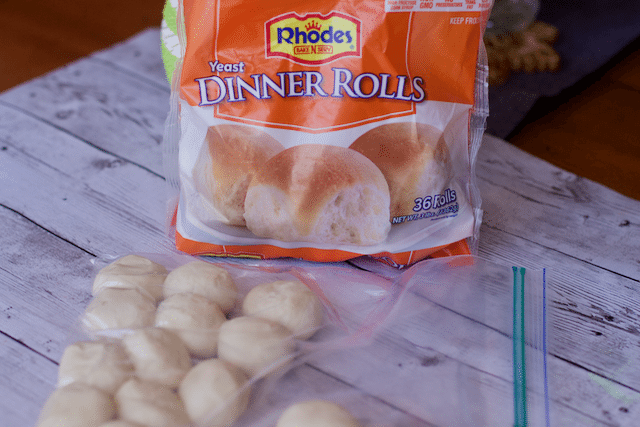 Defrost nine Rhodes Yeast dinner rolls for each pizza. You can use fewer and make individual sizes as well. 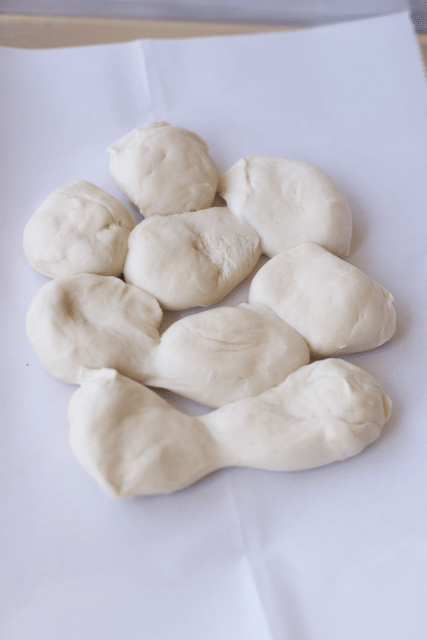 When the dough is room temperature, shape them into an egg shape. 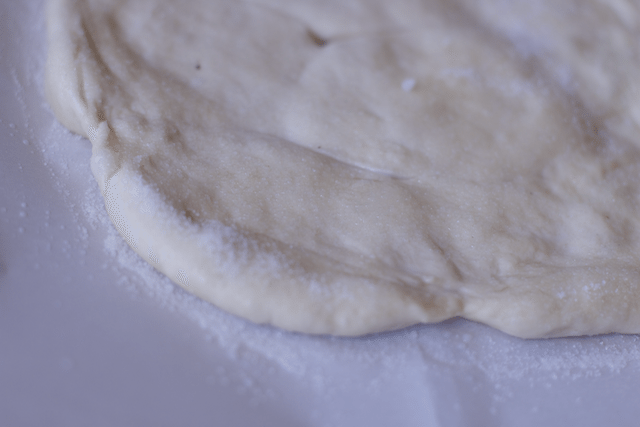 Roll it out as best you can, creating a small curst around the edges. 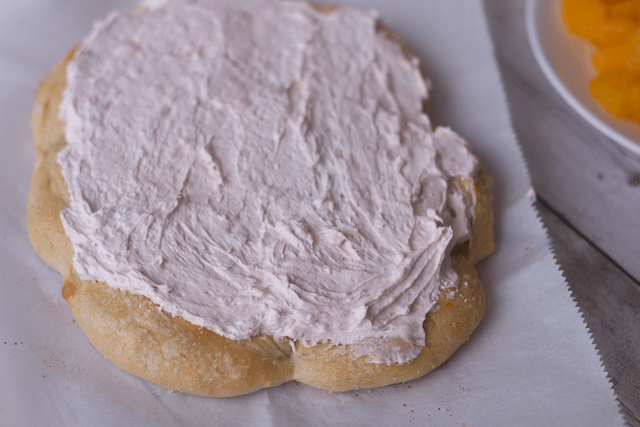 Brush a thin layer of milk on the entire piece of dough, and then sprinkle with sugar. The crust sprinkled with sugar is very pretty once it is baked. 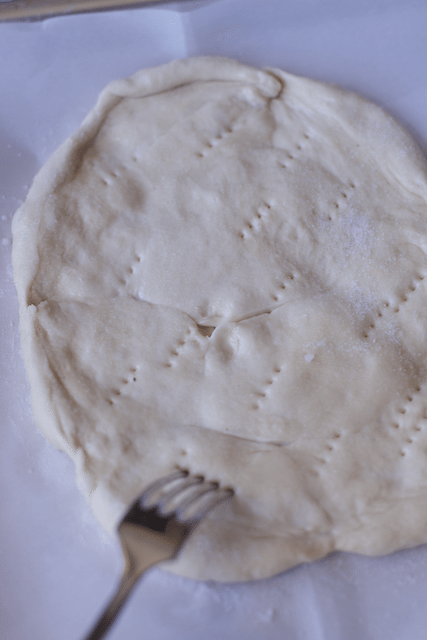 To prevent the crust from getting too high, use a fork to prick holes in the dough. Bake until a golden brown. This crust did remain flattened but I like it because it becomes a pull apart pizza. For the topping mix whipped topping and your favorite fruit flavored cream cheese. Spread onto the crust leaving a little of the sugar coated crust. Arrange your favorite fruits on the top of the cream cheese topping. We liked berries and canned mandarin oranges, but anything will do. Probably not a good time to use frozen fruit as it may be too watery. Here is our attempt at our Easter Egg Fruit Pizza. Just when we finished our photo shoot, I decided this fruit pizza needed some chocolate. Nutella and fruit is an amazing combination so I microwaved a small amount of nutella, about 45 seconds and then drizzled it on the fruit. Not only is it pretty it tasted amazing. Which Easter Fruit Pizza would you like more, chocolate or no chocolate? 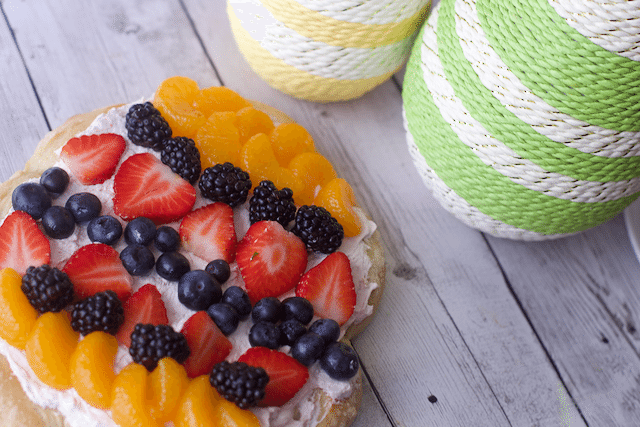 Easter Fruit Pizza can be made all year round. Spray counter lightly with non-stick cooking spray. Combine rolls together and roll into a 13-inch circle. We simply rolled it on a piece of parchment paper. 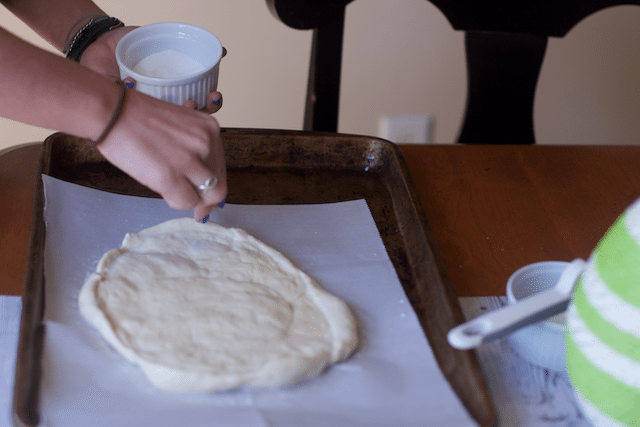 Place on a sprayed 12-inch pizza pan or one lined with parchment. . Build up edges slightly. Brush with milk and sprinkle with sugar. 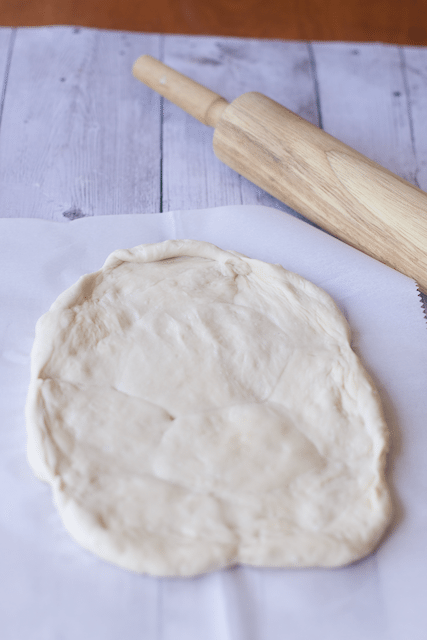 Poke crust several times with a fork to prevent air bubbles from forming. Now that is dressing up some dinner rolls! Love the addition of chocolate on top of all those berries. So yumm. I never thought about using dinner rolls! This is so awesome! 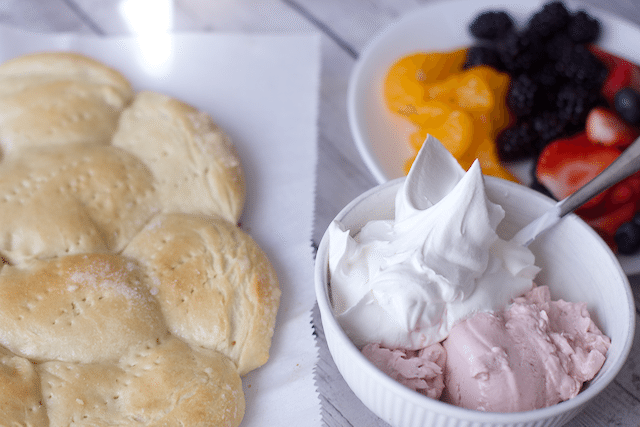 I’ve never had a dessert pizza before, but your recipe has me really intrigued! I love the addition of fresh fruit. This would definitely make a great, fun Easter dessert! yes this was delicious and an easy short cut. Love that you used rolls! Have seen a lot of cookie versions, but love this with the bread instead. I love fruit pizzas, never made them from purchased dough before. Great recipe for Easter!